SkyNet is one step closer to reality. A US Reaper drone shot down another with a missile, the Air Force said on Tuesday. The incident, which took place in November of last year and involved an unmanned target drone, was the first ever case of a drone shooting down another another aircraft, and according to Popular Mechanics, the event is a watershed moment in the history of aerial warfare, as unmanned aircraft begin to muscle in on air-to-air combat, which until now was the exclusive domain of manned aircraft. Speaking in an interview with Military.com, Colonel Julian Cheater, commander of the 432nd Air Expeditionary Wing, revealed the incident. The 432nd “Hunters” Wing is based at Creech Air Force Base, Nevada and is responsible for "unmanned precision attack and intelligence, surveillance, and reconnaissance missions...in support of overseas contingency operations." According to Military.com, the MQ-9 Reaper drone launched a infrared guided air-to-air missile against a “maneuvering target,” a smaller target drone. The missile scored a direct hit. The Air Force regularly shoots down target drones, but this is the first time an unmanned aircraft has shot down another aircraft. The air-to-air missile carried by the Reaper drone was likely a FIM-92 Stinger missile. Originally designed as a shoulder-fired surface-to-air missile, Stinger was adapted into a potent short-range air-to-air weapon. The use of unmanned drones by the U.S. military exploded in the post-9/11 era, with the remote-controlled craft initially taking on recon and later precision ground attack missions. But while expanding their missions into the world of air-to-air combat was inevitable and faced no serious technical challenges, it took a while for a drone to shoot down another aircraft. 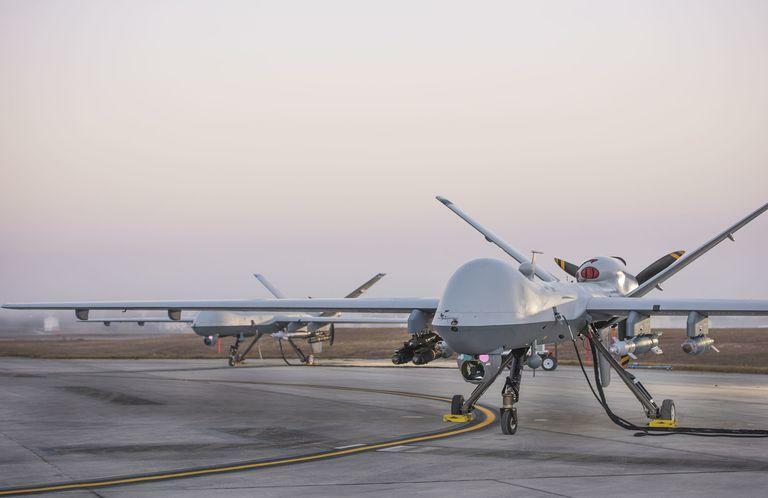 Reapers downing small unmanned drones is admittedly a long way from a futuristic vision of fleets of unmanned jet fighters, but the November incident was the first step. Unmanned air-to-air combat is inevitable and could be a regular mission sooner than most people think: The Pentagon is increasingly nervous about the prospect of enemy drones on the battlefield. Rather than task high-end F-35 fighters with the mission, drones like the Reaper could fight their own air-to-air battles, shooting down surveillance enemy drones with Stinger missiles.